Born and raised in a beautiful and very inspiring Russian city, St.Petersburg, Galina Carroll became a professional designer after getting her degree from a prestigious Academy of Arts. Later she moved to America near another inspiring and fashionable city of New York and continued her career by working with fashion houses such as Ralph Lauren, Donna Karan, Liz Claiborne, Tommy Hilfiger and various companies. 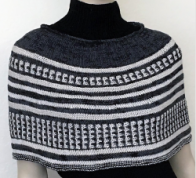 Her published designs can be seen in Vogue Knitting, Knit 1, Knit It, Knit Simple magazines, as well as various publications by and Tahki Stacy Charles, and Mission Falls. Her designs are contemporary and interesting in construction. Galina’s colorwork is vibrant and well-placed to make a statement. You can see it in these two photos of her designs for Vogue magazine. Galina’s work is inspiring. She is skillful in both knitting and crochet design. From her interview you can see that Galina is full of energy and ideas for many more new designs, so this is just a glimpse of her work that wets our appetite for more. Please read on. I finished high school and took the exam for college soon after but didn’t pass the exam the first time. Needless to say, I was very upset and depressed. A friend suggested to me that I should start knitting to calm my nerves. So I did and within one week I started and completed one vest and skirt. It turns out that I am a fast knitter. For many years I was working as a full time and freelance sweater designer in the garment industry in New York City. But about seven or eight years ago my career took a different turn when I met Adina Klein. At that time she was working at VK. She offered me a few projects for Vogue Knitting Magazine, and my relationship with Soho Publishing began. Here are a few photos of my work that were published in Knit1 and VK. I love to do Faire Isle, but mostly as a decorative detail. Stockinette as a basic stitch could look very interesting if you have unusual seams placement. I prefer to spend more time designing (executing) a garment rather than working on stitches. I have a degree in Industrial Design and I am always trying to reduce the weight and volume of my manufactured garments. Pattern on Ravelry: http://www.ravelry.com/patterns/library/gloveglove . Oh yes, it is different every day. Inspiration is everywhere, on the streets, in the architecture, museums, nature. Since my childhood I always was attracted to the flowers, as most girls are. Here are a few of my projects inspired by flowers. I love to see old movies. It is a great source of information. Here is a little project “seashell necklace”. I saw it on the beach and in a few days this necklace was born. These patterns are available on Ravelry. As every designer I have tons of yarn, lots of books and magazines, and my favorite pencils to make sketches. I just have a studio, nothing extraordinary. By the end of the week it gets very messy. Although I have to clean before I start my new project, as if you clean your thoughts before you try to say something important. I have a very cozy porch. It is my favorite spot in the summer; in winter, right next to the fire place. I have to feel warm and peaceful. And of course my little doggy Dasha (black and tan dachshund) is always by my side. No, but someday I would like to. Unfortunately no. I know I missed on that, but being a grandmother and doing so many projects takes most of my spare time. I have a lot of friends/designers. We communicate mostly by email, but a phone call or a real visit is my preference. The same with my knitters. Everybody seems to be busy bees. I was working for Mission Falls and you could see my work in their magazines: Dreamer 136, Duet, Accent, and Weekend. Vogue Knitting, Knit1,Knit Easy, Knit it for last seven years a few books: “Just wraps” by Lion Brand Yarn (Little Red)(The Flapper), “60 Quick Knits”(Scandinavian Mittens), (Cabled Scarf Hat). I have a few local students who come to my studio in Huntington, NY. I am also working to do classes online, teaching sketching. Hopefully, next year. As a rule I really don’t have complicated patterns. I love simplicity in the design in general. Besides, there are no strict rules in fashion. Sometimes making a mistake could even create a beautiful new garment. Oh, it is not enough paper to tell you about all my plans. Here are a few on my list: I am working on a proposal for a book. This book will have a lot of my sketches and knitting patterns, sort of a source book for designers, students and knitters. Second on my list is a Design Mohair competition for VK Live. I just finished my sketching and ordered the yarn. It will be very interesting. Here is the one pattern for Classic Elite Yarns and soon a second pattern will be on their website. It is free on Ravelry.com. Another one is a sweater for my little granddaughter Eva called “Pastel”. My Ravelry name is GalinaCarroll and you could see a lot of my projects and patterns there. I graduated from “Academy of Art and Industrial Design of V.Muchina in St.Petersburg, Russia. For that reason, I love to do anything that involves design: interior design and decoration, paint, textile design, jewelry and fashion. I do consultation as a stylist (personal shopper) and interior decorator. My latest hobby is video making. I have my YouTube channel (http://www.youtube.com/user/GalinaCarroll ) where you will find my personal and professional videos. In my personal life I have a wonderful husband and a loving daughter who lives nearby. I also have two grandchildren Phillip, who is three years old and Eva is who is nine months. At least two days of my week are dedicated to them. So I am still “full time” – a busy wife, grandmother and always a designer. I want to thank you, Faina, for the invitation to this interview. It is a wonderful way to know more about person. You are doing a fantastic job! FG: Galina, it was a pleasure working with you on this interview. I encourage our readers to visit your Ravelry designer page to enjoy all of your designs. I wish I could post them all here. It’s just too many of them 🙂 I loved reading about your inspirations. Good luck with your book and VK mohair project competition. I am looking forward to both.